The error report is a feature we are very proud of at ConvertMyLogbook. It is a mathematical audit of your entire logbook showing where totals were incorrect and why the final digital file doesn’t match what is written in the paper logbooks. There are two benefits to this. Most of the errors fall into very few categories, in order of most common to least common, though by no means an exhaustive list. So what’s going on here? First, understand that the Excel portion at the bottom is straight across as one row in the actual error report. What does this mean in my case as this is a page from my personal logbook? All the times in the XC column add up to 51.8 hours. I must make an adjustment of 0.3 (Yellow D) to make that match what I have written in my logbook (Yellow B/C). 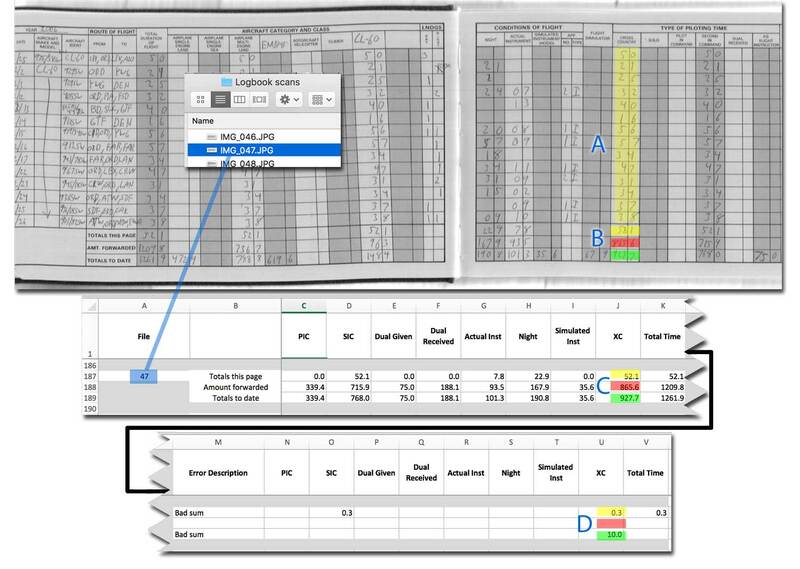 If I total all the adjustments made for the XC column in all logbooks (Excel column U) and add that to the XC total in my new digital logbook, it will equal the final XC value in my paper logbook. You might be asking “what should I do with this information?”. We don’t recommend trying to make your paper logbook perfect by correcting all the mistakes; that usually leads to additional mistakes. If you want to keep logging in your paper logbook as well and make sure that everything matches, the easiest thing to do it create an adjustment entry in the paper logbook on one line. Add up all the errors in the error report in a specific column, across all error reports (i.e. XC column in logbook 1, 2, etc) and enter the inverse of whatever that number is in the proper column in the paper logbook. For example if all numbers added up are -5.1, then enter +5.1. The adjustment will bring the times in the paper logbook in line with the electronic logbook. NOTE: Do not apply adjustment to ASEL or AMEL columns as we use those to track consistency across types and identifiers; The columns are not totaled in the same way and thus do not provide accurate times.